For Chris and Nancy and their four children, summers are for enjoying sunny days at the beach and evenings together at their beach cottage. They live in Portland, Oregon most of the year, but they head to Rehoboth Beach every summer. Chris cherishes happy memories from working as a lifeguard in Rehoboth Beach throughout his college years, and it’s important to him that his kids share a similar experience as they grow up. The family has strong ties to the area, and they love its close-knit community and stunning natural beauty. Two years ago, Chris and Nancy bought a beach cottage a stone’s throw away from the ocean. It has a great location and a lot of potential, but the layout is ill-suited to their large family. 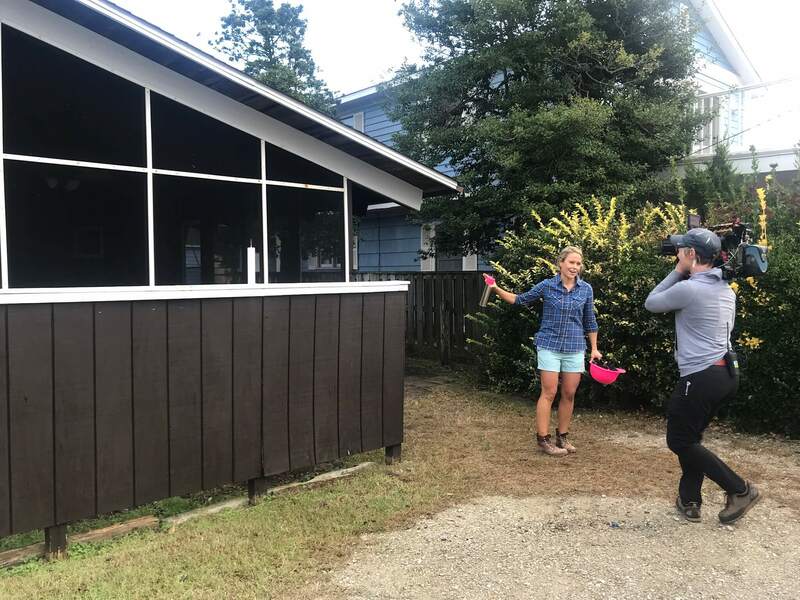 Luckily, Chris and Nancy were open to all of my wild ideas, so we got to work upgrading their beach house! Problem: It had the architectural features of a classic beach cottage, but its exterior appearance didn’t match this aesthetic at all. The dark brown color weighed it down, making it look small and cramped – not spacious and airy like Chris and Nancy wanted. Solution: The yard had extra space that could be better used inside, so I extended the front gable of the house. This renovation opened up the communal areas, adding a full dining room and an expanded enclosed porch. I brightened up the exterior by getting rid of the dark brown color for good. I installed a cedar shingle accent wall on the front elevation, and white, V-groove vertical vinyl siding on all the other exterior walls. During this process, I also ran into an unexpected structural problem: there was no stable foundation, and the house was only held up by cinderblocks. Surprise! So adding a new foundation became another important item on my to-do list. Problem: The enclosed porch should have been a favorite family hangout. Instead, it was a neglected, awkwardly arranged area – not exactly welcoming! 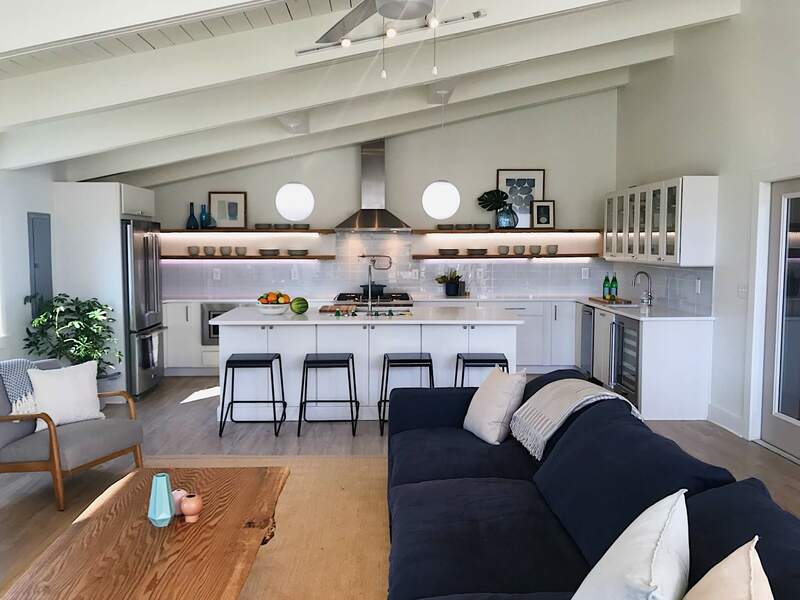 Solution: The family feels a strong connection to nature when they spend time at their beach house, and I wanted to incorporate that sensibility throughout the home with natural organic design elements. Since the enclosed porch is the perfect balance of indoors and outdoors, I started with that entryway. I built planter beds recessed into the deck, and filled them with flowing locally inspired dune plants and grasses. This splash of green was the breath of fresh air the entrance needed. Problem: There was no real dining room in the existing space – only a collection of worn, mismatched tables and chairs in the enclosed porch. For a family that loves to cook and entertain, this had to change. 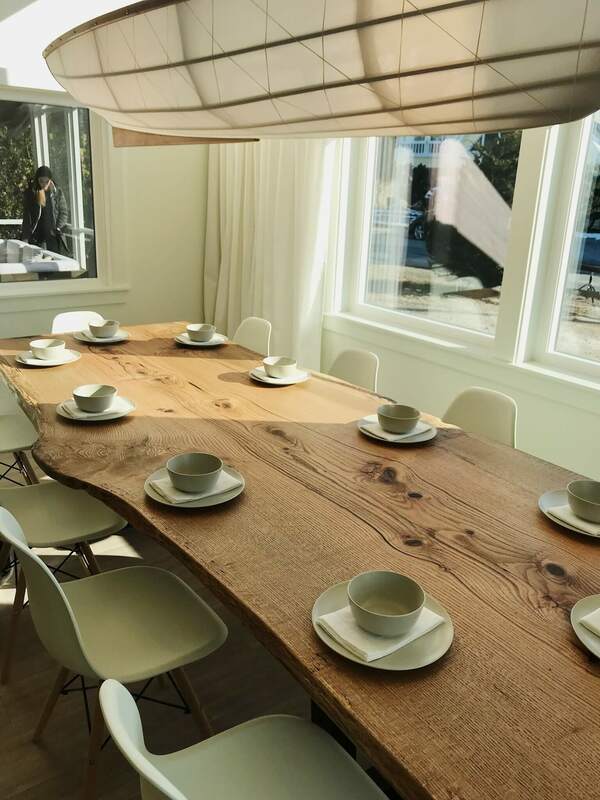 Solution: The new dining room needed a real “wow” factor. It had to be a place where family and friends could come together to enjoy each other’s company and enjoy long meals. I cleared out the cluttered hodgepodge of furniture to make room for the centerpiece: a custom-built live edge dining table that seats 10. Its beautiful curved lines and rustic appearance reflected the family’s love of nature. But I didn’t stop there! 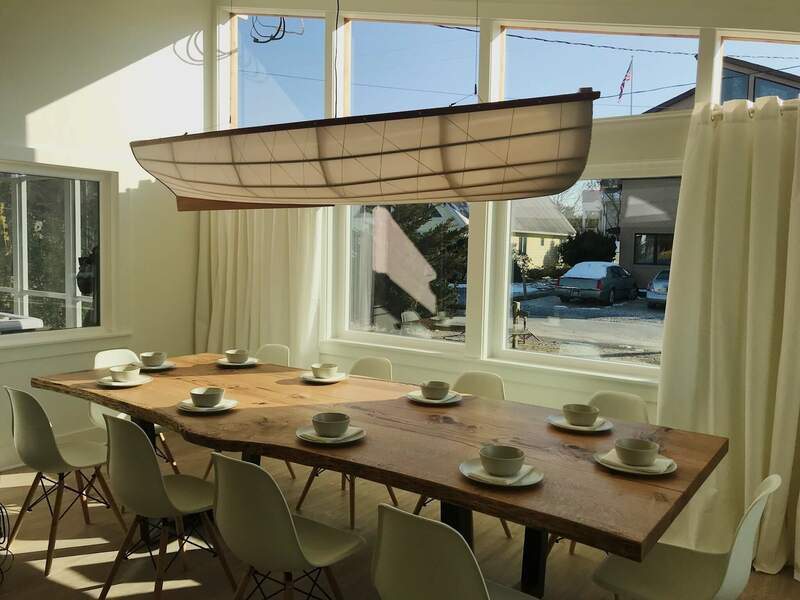 I collaborated with lighting artisan John Murray to create a stunning nautical-inspired light fixture that illuminates through the front windows. The finished dining room design was bright, beachy and perfect for company. Problem: What living room? The elephant in the room was the enormous beast of a couch that took over the whole space! Between this giant sectional sofa and an equally huge coffee table, there wasn’t a whole lot of leeway for anything else. Solution: Bye-bye, big sofa; hello, more breathing room. 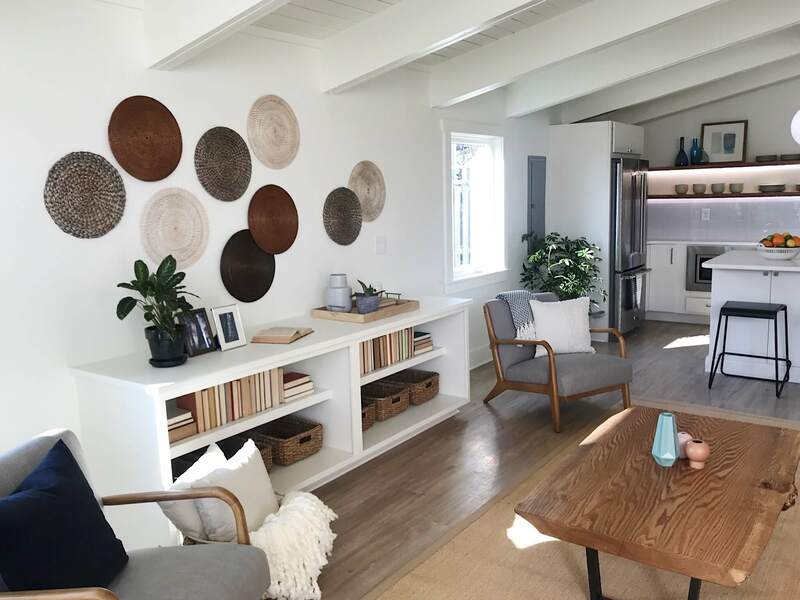 I replaced the existing furniture with pieces that were much more proportional to the square footage, including a lighter sofa (that can still squeeze in several people) and a live edge coffee table that complements the dining table. For extra space maximization, I also put in low, simple built-in storage under the windows on the side wall. Problem: This itty-bitty corner had to be the most depressing kitchen of this season (and that’s saying something)! It felt like it belonged in a drab New York City walk-up – not in a charming Rehoboth beach cottage. It demanded more space, functionality and aesthetic appeal to fit this stylish family. Solution: This is a family that enjoys cooking together, so I had a blast designing an expansive chef’s kitchen ideal for their foodie endeavors. 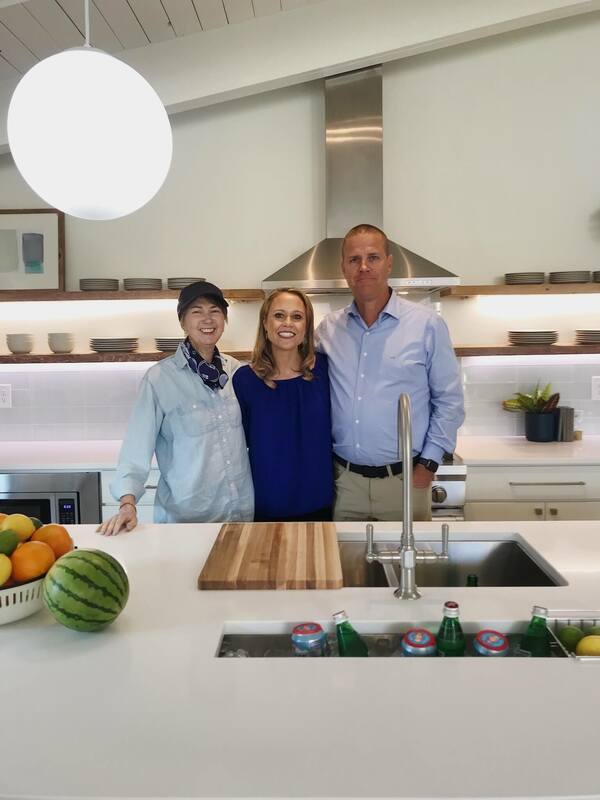 Chris and Nancy prefer a minimalist, clean-lined look, so I installed quartz counter tops, a glass tile backsplash, and white, flat-panel kitchen cabinets fitted with a mix of glass uppers, flat-panel uppers and rustic wood shelves. I swapped out the existing fixtures and appliances with high-end replacements. And for a final glamorous touch, I built an ice trough into the kitchen island. It’s all ready to hold wine, beer and a raw bar at their first party of the season. 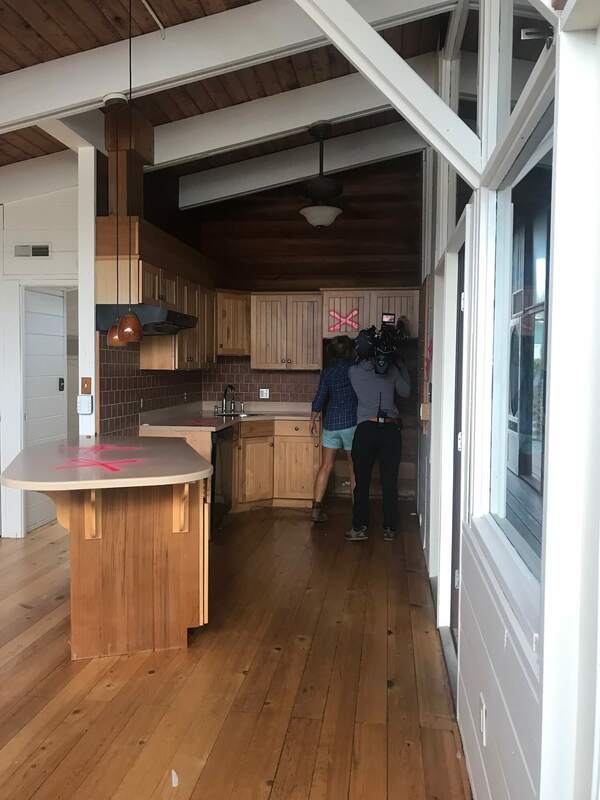 Problem: The existing interior breezeway was long and dark, far too ominous for a sunny beach house. Solution: I replaced the depressing wood paneling with vertical V-groove vinyl siding that matched the house’s exterior and instantly illuminated the space. 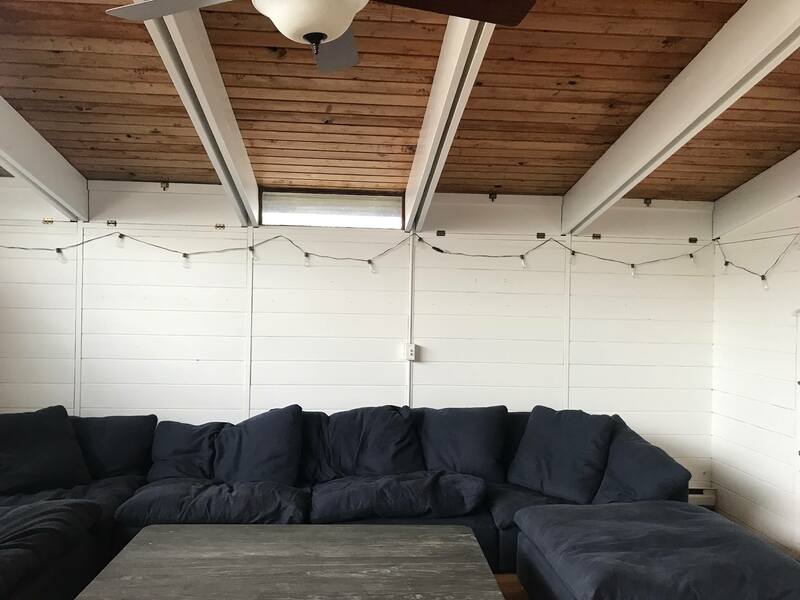 I added a continuous peg railway along the entire breezeway, providing an elegant and practical solution to storage for all those bathing suits, towels and bags that can clutter a beach home. Problem: These bathrooms were downright scary with their gloomy lighting and wood paneling. Even scarier, one poor girl had to share a bathroom with three boys! Solution: I reframed the walls to add a set of sleek, matching bathrooms off the kids’ rooms, freeing the youngest daughter from having to share with her older brothers. These modern bathrooms featured new lighting and plumbing, as well as clean white tile and fresh paint. Chris, Nancy and their kids are now ready to welcome summer with open arms. 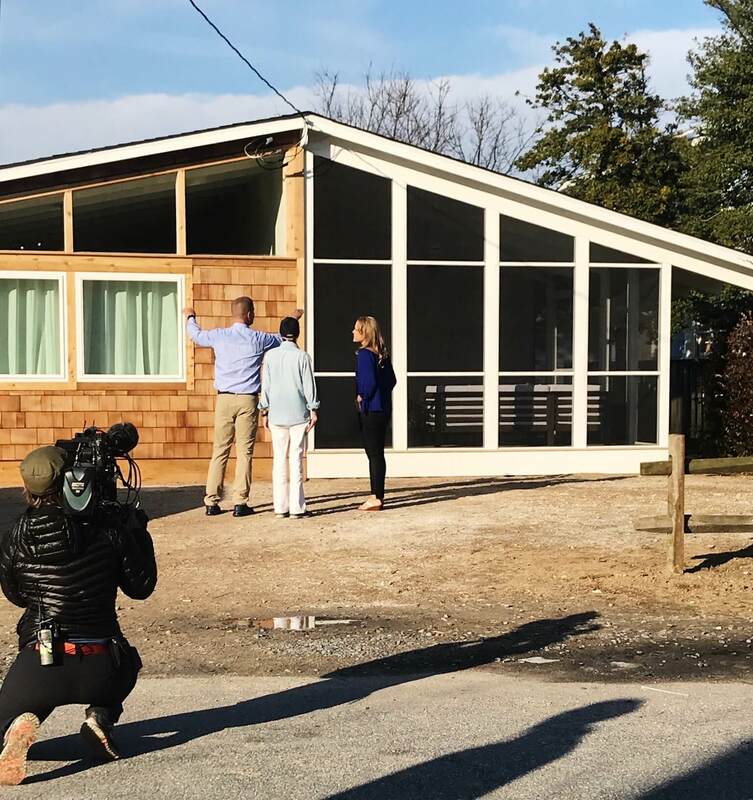 I can’t wait to hear how they continue to make new memories in their beloved beach home. 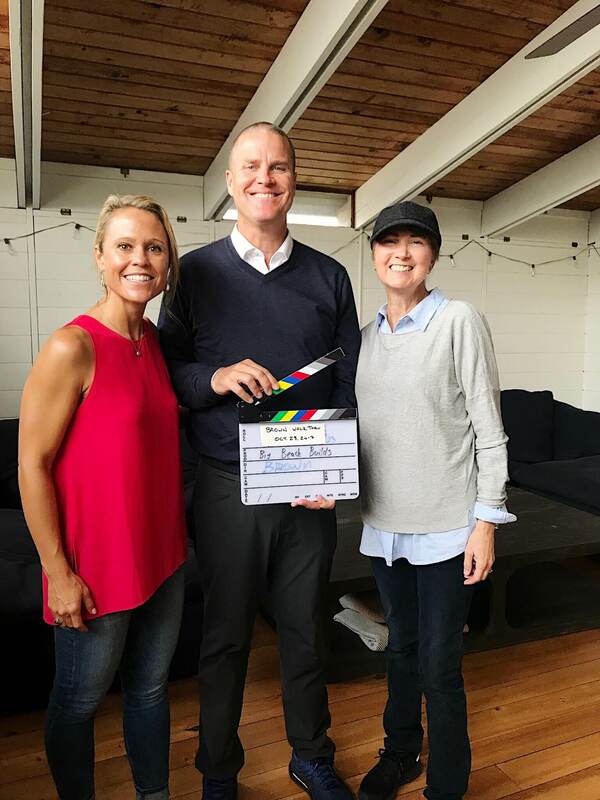 See you next week, same time (Monday at 9/8c) and same place (DIY Network)!